The Calgary Flames are a professional ice hockey team based in Calgary, Alberta, Canada. The Flames are members of the Pacific Division of the Western Conference of the National Hockey League (NHL). The club is the third major-professional ice hockey team to represent the city of Calgary, following the Calgary Tigers (1921–27) and Calgary Cowboys (1975–77). The Flames are one of two NHL franchises in Alberta; the other is the Edmonton Oilers. The cities' proximity has led to a rivalry known as the Battle of Alberta. The Flames were the result of the NHL's first pre-emptive strike against the upstart World Hockey Association (WHA). In December 1971, the NHL hastily granted a team to Long Island—the New York Islanders —to keep the WHA's New York Raiders out of the brand new Nassau Veterans Memorial Coliseum. Needing another team to balance the schedule, the NHL awarded a team to an Atlanta-based group that owned the National Basketball Association's Atlanta Hawks, headed by prominent local real estate developer Tom Cousins. Cousins named the team the "Flames" after the fire resulting from the March to the Sea in the American Civil War by General William Tecumseh Sherman, in which Atlanta was nearly destroyed. They played home games in the Omni Coliseum in downtown Atlanta. In 1980, Cousins was in considerable financial difficulty and was forced to sell the Flames to stave off bankruptcy. With few serious offers from local groups, he was very receptive to an offer from Canadian entrepreneur (and former Oilers owner) Nelson Skalbania. He was fronting a group of Calgary businessmen that included oil magnates Harley Hotchkiss, Ralph T. Scurfield, Norman Green, Doc and Byron Seaman, and former Calgary Stampeders great Norman Kwong. A last-ditch effort to keep the team in Atlanta fell short, and Cousins sold the team to Skalbania for US$16 million, a record sale price for an NHL team at the time. On May 21, 1980, Skalbania announced that the team would move to Calgary. He chose to retain the Flames name, feeling it would be a good fit for an oil town like Calgary, while the flaming "A" logo was replaced by a flaming "C". Skalbania sold his interest in 1981, and the Flames have been locally owned since. Led by Kent Nilsson's 49-goal, 131-point season, the Flames qualified for the playoffs in their first season in Calgary with a 39–27–14 record, good for third in the Patrick Division. The team found much greater playoff success in Calgary than it did in Atlanta, winning their first two playoff series over the Chicago Black Hawks and Philadelphia Flyers before bowing out to the Minnesota North Stars in the semi-finals. This early success was not soon repeated. After a losing record in 1981–82, Fletcher jettisoned several holdovers from the Atlanta days who could not adjust to the higher-pressure hockey environment and rebuilt the roster. Over the next three seasons, he put together a core of players that would remain together through the early 1990s. The players acquired by Fletcher matured into one of the strongest teams in the league during the mid-1980s and early 1990s. From 1984–85 to 1990–91, the Flames tallied 90 points in every season but one. However, they were usually unable to transform that success into a deep playoff run, largely because they could not get the better of their provincial rivals, the powerhouse Oilers. Although the Oilers and Flames usually finished at or near the top of the Campbell Conference, the NHL's playoff structure of the time made it very likely that the Flames would meet the Oilers in either the first or second round, rather than in Campbell Conference finals. That same structure made it very likely that the other two playoff qualifiers in the Smythe Division would have to get past the Flames or Oilers (or both) in order to make it to the conference finals. From 1983 until 1990, either the Oilers or the Flames represented the Campbell Conference in the Stanley Cup Finals. By 1986 the Flames landed forwards Doug Risebrough, Lanny McDonald, and Dan Quinn, defenceman Al MacInnis, and goaltender Mike Vernon. Finishing second in the Smythe with a 40–31–9 record (the only season from 1984 to 1991 in which they did not finish with 90 or more points), the Flames swept the Winnipeg Jets in the first round of the playoffs, setting up a showdown with the Oilers. Edmonton finished 30 points ahead of Calgary during the season, and was heavily favoured to win a third Cup in a row. However, the Flames upset the Oilers in seven games—the only time that the Flames defeated the Oilers in a playoff series during the decade. The series-winning goal came when an errant clearing attempt by Steve Smith ricocheted off goaltender Grant Fuhr's leg and into his own net. The goal remains one of the most legendary blunders in hockey history. From there, the Flames went on to the Campbell Conference Finals, where they defeated the St. Louis Blues in another seven-game series. This time, Calgary had to survive a scare of its own, shaking off the Monday Night Miracle at the St. Louis Arena. Trailing by a score of 5–2 with 10 minutes to play in the third period of Game 6, the Blues mounted a furious comeback to send the contest into overtime, where Doug Wickenheiser scored to force a deciding seventh game. Calgary would win Game 7 at home, 2–1, advancing into the Stanley Cup Finals for the first time. The Flames proved to be no match for the Montreal Canadiens, losing the championship series in five games. Montreal rookie goaltender Patrick Roy was nearly unbeatable in the last two games, allowing only four goals en route to winning the Conn Smythe Trophy. The Flames then made short work of the Kings, defeating them in four straight, before eliminating the Chicago Blackhawks in five games to set up a rematch of the 1986 Stanley Cup Finals against Montreal. This time, the Flames won in six games, the last being a 4–2 victory in Montreal on May 25, 1989. The clinching win was especially significant in that it marked the only time that an opposing team defeated the Canadiens to win the Stanley Cup on Montreal Forum ice. Al MacInnis captured the Conn Smythe as playoffs' most valuable player, while long-time captain Lanny McDonald announced his retirement. The 1989 Stanley Cup win gave Flames co-owner Sonia Scurfield (Ralph's widow) the distinction of being the first (and as of 2013, only) Canadian woman to have her name engraved on the Cup. It also made Kwong one of the few to have his name on both the Stanley Cup and the Grey Cup. In 1989, due in part to Cliff Fletcher's diplomatic efforts, the Soviets gave permission for a select group of Soviet hockey players to sign with NHL teams. The first of these players was Sergei Pryakhin. Although Pryakhin never became an NHL regular, his arrival blazed a trail for the large number of Russian players who entered the NHL beginning in 1989–90. Sergei Makarov joined the Flames that season and, though already in his thirties, became the fifth Flame to win the Calder Memorial Trophy as the league's Rookie of the Year. The selection would prove controversial, prompting the league to amend the rules to exclude any player over the age of 26 from future consideration. That season, the team fell two points shy of their third straight Presidents' Trophy with 99 points. Also that season, they won their third straight Smythe Division title. In the playoffs, they were dethroned in six games by the Los Angeles Kings. They would not win another playoff series until 2004—one of the longest such droughts in NHL history. In 1991, Fletcher left the Flames to become the general manager of the Toronto Maple Leafs. He had been the team's general manager since its inception in 1972. He was succeeded in Calgary by Doug Risebrough, and the two quickly completed a ten player mega-trade that saw disgruntled forward Doug Gilmour dealt to Toronto with four other players for former 50 goal scorer Gary Leeman and four others. The trade transformed both clubs. The formerly inept Leafs turned into a contender almost immediately, while Leeman scored only eleven goals in a Flames uniform. Despite the blossoming of Theoren Fleury into an NHL star, the Flames missed the playoffs entirely in 1992, only a year after finishing with their third 100-point season in franchise history. It was the first time the Flames had missed the playoffs since 1975, when they were still in Atlanta. It was also only the third time out of the playoffs in the franchise's 20-year history. Calgary rebounded to make the playoffs for the next four seasons, including two consecutive division titles. However, they were knocked out in the first round of the playoffs each time. The 1994 and 1995 Division titles led to Game 7 overtime home defeats in the opening round to the Canucks and San Jose Sharks respectively. In the 1995–96 season, Nieuwendyk was traded to the Dallas Stars in a deal that acquired Jarome Iginla. Iginla would make his Flames debut in the 1996 postseason during which the Flames again lost in the first round, a four-game sweep by the Blackhawks. In 1997, only two years after winning their second consecutive division title, the Flames missed the playoffs and would not return for seven years. The low point came in the 1997–98 season, in which the Flames finished with only 67 points, the second-lowest point total in franchise history (behind only the 1972-73 Atlanta Flames). During this time, the Flames found it increasingly difficult to retain their best players as salaries escalated while the Canadian dollar lost value against the American dollar. Calgary has always been one of the smallest markets in the league (it is currently third-smallest, behind only Edmonton and Winnipeg) and the NHL's small-market Canadian teams found it increasingly difficult to compete in the new environment. In 1999, for example, the Flames traded Fleury to the Colorado Avalanche midway through the season. The trade came shortly after Fleury became the franchise's all-time leading scorer. Fleury was due to become an unrestricted free agent at the end of the season, and the Flames did not want to risk losing him without getting anything in return. One of the few bright spots in this stretch was Iginla, who captured the Rocket Richard and Art Ross Trophies in 2001–02 as NHL goal- and point-scoring champion after scoring 52 goals and 96 points. Iginla again won the Rocket Richard Trophy, tied with Rick Nash and Ilya Kovalchuk, with 41 goals in 2003–04. Another bright spot for the team during this time was defenceman Robyn Regehr who became the youngest nominee ever for the Bill Masterton Memorial Trophy, which recognizes perseverance, sportsmanship and dedication to hockey. Regehr had suffered two broken legs in a car accident the summer of 1999, but recovered in time to play 57 games at the age of 19. The Flames then upset the Presidents' Trophy winning Detroit Red Wings in six games. After eliminating the Pacific Division champion Sharks, also in six games, in the Western Conference Final, the Flames earned a trip to the 2004 Stanley Cup Finals to face the Tampa Bay Lightning. Martin Gelinas scored the winning goal in all three series. The Canadian Embassy in Washington DC, flew the Flames flag beside the Maple Leaf, while Prime Minister Paul Martin dubbed the Flames "Canada's team". The final series went to seven games, with the Flames suffering a controversial non-goal in game six at home. Replays showed that Martin Gelinas may have scored what would have been the go-ahead goal late in the third period; however, the referees never signaled a goal, and later replays were ruled inconclusive. The goal would have made Gelinas the only player in NHL history to score the winning goal in every playoff series en route to winning the Stanley Cup. The Lightning would go on to win the game in double overtime, before winning game seven at home to capture the Stanley Cup. Despite the loss, 30,000 fans packed into Olympic Plaza to celebrate the Flames run. The Flames would not raise their Western Conference championship banner for nearly 15 months, as the 2004–05 season was wiped out by a labour dispute. During the lockout, team owner and Chairman of the Board, Harley Hotchkiss, attempted to save the season by engaging in discussions with National Hockey League Players Association president Trevor Linden. While their discussions failed to save the season, Hotchkiss was credited with easing tensions that allowed for a successful negotiation of a new collective bargaining agreement. Prior to the start of the 2007–08 season, the Flames demoted Playfair to associate coach, bringing in Mike Keenan as the team's third head coach in three years. During the season, Jarome Iginla became the Flames' all-time leader in games played, passing Al MacInnis' mark of 803. Iginla also passed Theoren Fleury's mark of 364 goals to become the Flames all-time goal scoring leader on March 10, 2008. Despite another solid season, with 94 points, they only garnered the seventh seed in the Western Conference. They fell in the Western Conference quarterfinals to the Pacific Division champion Sharks in seven games. Iginla continued to set franchise records in 2008–09, surpassing Fleury's franchise mark of 830 points, and scoring his 400th goal on the same night against the Lightning. The team failed to advance past the first round of the playoffs, being knocked out by the Chicago Blackhawks in 6 games, resulting in the dismissal of head coach Mike Keenan after two seasons. Brent Sutter was named his successor on June 23, 2009, but the Flames failed to qualify for the playoffs in the 2009–10 season. The Flames struggled to begin the 2010–11 NHL season, falling to 14th place in the conference at the Christmas break. Consequently, the organization asked Darryl Sutter to step aside as general manager. The team named assistant Jay Feaster the interim general manager in his place, making it permanent following the season. The team pulled itself back into playoff contention following the change but once again failed to qualify for the post-season. Calgary hosted the 2011 Heritage Classic, the NHL's second outdoor game of the year, at McMahon Stadium on February 22, 2011. The Flames defeated the Canadiens 4–0 before 41,022 spectators. Miikka Kiprusoff became the first goaltender to record a shutout in an NHL outdoor game. Jarome Iginla reached two major milestones late in the season. He became the 10th player in NHL history to score at least 30 goals in ten consecutive seasons, and scored his 1,000th career point, all with the Flames, with a goal against the St. Louis Blues on April 1. Iginla also scored his 500th career goal on January 7, 2012, against the Minnesota Wild. He scored the goal against goaltender Niklas Backstrom en route to a 3-1 Flames victory. On March 27, 2013, longtime captain and player Jarome Iginla was traded to the Pittsburgh Penguins for prospects Kenny Agostino and Ben Hanowski and a first-round pick in 2013 (Morgan Klimchuk), leaving the team without a captain for the first time since the end of the 2002–2003 season. Prior to the beginning of the 2013–14 NHL season, Mark Giordano was named as the new captain of the Calgary Flames. The Flames used their low finishes in the 2012-13 and 2013-14 seasons to draft prospects such as Sean Monahan, Emile Poirier, Morgan Klimchuk, and Sam Bennett - prospects who are expected to greatly assist the Flames towards victory in future seasons. In the 2014–15 season, the Flames, assisted by 2013 draft pick Monahan and other highly touted prospect Johnny Gaudreau, won one of their final home games against the Los Angeles Kings to clinch their first playoff spot since 2009, which eliminated the Kings from the playoffs. They eliminated the Vancouver Canucks in six games in the first round of the playoffs (which was their first playoff series win since 2004) but would be eliminated by the Anaheim Ducks in five games in the second round. In May 2016, Head Coach Bob Hartley was relieved of his duties. In 1994, the Flames approached the Saddledome Foundation with a proposal to renovate the Olympic Saddledome, rename it the Canadian Airlines Saddledome and take over management of the facility. The board agreed to this proposal, and was bought out by the Flames for $20 million as the team signed a 20-year agreement to manage the building. During the Flames' run to the Stanley Cup Finals of 2004, most of the Flames fans attending the hockey games at the Saddledome wore a red jersey with Calgary's flaming C on it. Sales of the Flames red home jersey, introduced at the start of the 2003–04 campaign, were so strong during the playoffs that manufacturer CCM stopped production on all other team jerseys in order to keep up with demand of Flames uniforms. The team set a league record for sales of a new uniform design. The tradition of the C of Red dates back to the 1986 Stanley Cup playoffs against the Oilers. Oiler fans were donning hats promoting "Hat Trick Fever" in their quest for three straight Stanley Cups. Flames fans countered by wearing red. In the 1987 playoffs against Winnipeg, the Jets responded to the C of Red by encouraging fans to wear white, creating the "Winnipeg Whiteout". During Flames games when "The Star-Spangled Banner" is sung, fans shout the words see and red to signify the "C of Red" theme. The Calgary Flames' original jerseys retained the basic design the team wore in Atlanta: white jerseys with red shoulders and red and yellow stripes, and solid red jerseys with yellow and white stripes. In 1994, the Flames modified their jersey design, adding black to the team's colour scheme. The new striping pattern included a diagonal set of stripes from the base of the jersey on the player's right side coming up to just below the logo. The contrasting shoulder panels on both jerseys were extended down the sleeves, and contained the striping pattern on the forearms. For the 1996-97 season, the Flames reintroduced the Atlanta logo as their alternate captain's patch, and briefly experimented with using a smaller version of the "flaming C" as a captain's patch. Although the C was soon reverted to match the jersey's nameplate, the A logo patch remains in use to this day. In 1998, to celebrate the "Year of the Cowboy", the Flames introduced its inaugural third jersey design, featuring the "flaming horse" logo on a black background. Two years later, the jersey became the Flames' road jersey, while the home jersey was updated to incorporate the same V-style striping on the arms and waist of the jersey. This jersey was once again relegated to third jersey status in 2003 when the NHL adopted the coloured jerseys for the home team. In 2007, with the introduction of the Rbk Edge jersey, the Flames updated their look once again, replacing the horizontal striping with vertical striping down the sides. To honour the team's heritage, the Flames added the flags of Alberta and Canada as shoulder patches. In celebration of their 30th season in Calgary, the Flames wore their original jersey design for five games in 2009–10, each against a Canadian opponent. The 2009-10 version of the jersey was produced in the traditional style that preceded the Edge redesign; for the following season, the throwback design was adapted to the Edge format as the Flames' new regular third jersey. For the 2011 Heritage Classic, the Flames were matched against the Montreal Canadiens at McMahon Stadium. For this event game, the Flames wore uniforms inspired by the Calgary Tigers, the city's first professional hockey team from the 1920s, which represented the Western Canada Hockey League in the 1924 Stanley Cup Finals against the Canadiens. The Flames adapted the Tigers' black-and-gold jerseys to darker shades of their own colours - maroon and burnt yellow, with a yellow stripe across the chest and alternating stripes on the sleeves. The flaming C logo and pants were cream-coloured, adding to the "vintage" look of the uniform. In 2013, the Flames introduced a new third jersey to replace their throwback uniform. The newest design is Western-inspired, with a script Calgary in black across the front of the jersey, and black shoulders with points on the front mimicking cowboy wear. The throwback uniform is no longer used. Harvey the Hound is the Flames' mascot. He was created in 1983 to serve both with the Flames and the Calgary Stampeders of the Canadian Football League. Harvey was the first mascot in the NHL. Harvey is famous for an incident in January 2003 where he had his tongue ripped out by Edmonton Oilers head coach Craig MacTavish as he was harassing their bench. The incident made headlines throughout North America and led to much humour, including having many other NHL team mascots arrive at the 2003 All-Star Game with their tongues hanging out. Lanny McDonald and Mike Vernon are the only two Flames to have their numbers retired by the team, while Al MacInnis and Joe Nieuwendyk have had their numbers honoured by the team (they are still in circulation) as part of the Flames' "Forever a Flame" program. All four of these players won the Stanley Cup with the Flames in 1989. The Calgary Flames have retired two numbers, and a third was retired league-wide. The Flames retired #9 in honour of Lanny McDonald who played right wing for the Flames from 1981 to 1989, winning the Stanley Cup as the Flames' co-captain in his final year. Mike Vernon's #30 is also retired; he was a goaltender with the Flames for fourteen years, from 1982–94 and 2000-02. 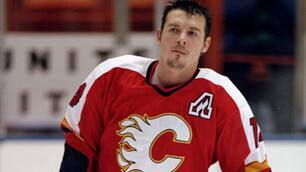 Although not officially retired, the Flames have not issued #14 since Theoren Fleury left the team in 1999. In 2012, the Flames organization introduce "Forever A Flame" programme to honour those who played and represented the Calgary Flames without having to retire their numbers. It enables future Flames the opportunity to wear the numbers of some of the Flames all-time greats. On February 27, 2012, defenceman Al MacInnis was the first to earn this distinction, with a banner with his picture and the #2 number raised to the Scotiabank Saddledome rafters. Joe Nieuwendyk followed him on March 7, 2014, promoted as "Forever 25" as both the number on Nieuwendyk's jersey and the 25th anniversary of the 1989 title. Several members of the Flames organization have been honoured by the Hockey Hall of Fame during the team's history in Calgary. Lanny McDonald was the first Flame player inducted, gaining election in 1992. McDonald recorded 215 goals in 492 games for the Flames, including a team record 66 goals in 1982–83. He was joined in 2000 by a fellow member of the 1989 Stanley Cup championship team, Joe Mullen. Mullen spent five seasons with the Flames, recording 388 points and capturing two Lady Byng Trophies. Grant Fuhr, elected in 2003, became the third former Flames player to enter the Hall. Fuhr played only one season in Calgary; however, he recorded his 400th career win in a Flames uniform, a victory over the Florida Panthers on October 22, 1999. In 2007, Al MacInnis became the fourth former Flame inducted into the Hall, and the third to earn his Hall of Fame credentials primarily as a Flame. MacInnis was a member of the Flames from 1981 until 1994. He is best remembered for his booming slapshot, as well as for winning the Conn Smythe Trophy in 1989 as playoff MVP. On November 9, 2009, Brett Hull became the fifth player in Calgary Flames history to be inducted into the Hockey Hall of Fame. Hull was drafted 117th in the 1984 NHL Entry Draft by the Flames, and began his NHL career playing two seasons (1986–1988) with Calgary. On June 28, 2011, it was announced that former Flames forwards Doug Gilmour and Joe Nieuwendyk would become the sixth and seventh members to enter the Hockey Hall of Fame in the players category. On June 29, 2015, the Hockey Hall of Fame announced defenseman Phil Housley would be enshrined in the Class of 2015, making him the eighth player in Flames history to gain that honour. Housley played for the Flames on two separate occasions, (1994-1996 and 1998-2001). Former head coach "Badger" Bob Johnson joined McDonald in the class of 1992, gaining election as a builder. Johnson coached five seasons with the Flames from 1982–87, and his 193 wins remain a team record. Cliff Fletcher was the Flames general manager from the organization's inception in 1972 until 1991, a span of 19 years. During that time, the Flames qualified for the playoffs sixteen consecutive times between 1976 and 1991. Fletcher was inducted in 2004. In 2006, Harley Hotchkiss became the third Flames builder to gain election. Hotchkiss was the team's governor, and was an original member of the ownership group that purchased and brought the Flames to Calgary in 1980. He has served many years as the chairman of the NHL Board of Directors, during which he played a significant role in the resolution of the 2004–05 lockout. Fellow original owner Doc Seaman was similarly inducted in 2010. On June 29, 2015, former player Bill Hay was elected to the Hockey of Fame in the builders category. Hay served as president and CEO for the Flames in the 1990s. Lanny McDonald presents Jarome Iginla with a gold stick. The pair of former captains are the only players to score their 500th career goal in a Flames uniform. Wikimedia Commons has media related to Calgary Flames.